Round 5 has taken the next step forward in its offering of UFC collectibles with today’s introduction of UFC Live Series 1, featuring all-time UFC greats Randy Couture and Chuck Liddell from their historic UFC 43: Meltdown bout. The two superstars will be sculpted in highly-detailed, realistic, scaled figure statues, packaged separately and available at retail during the 2010 holiday season, it was announced today by Barron Lau, Round 5 CEO and co-founder and Damon Lau, president and co-founder.Created with the higher-end collector in mind, these premium figures will measure a full 10 inches and will also come with a UFC-branded display stand. Together, the Couture and Liddell figures, created at a 1/7 scale, complete a battle scene from the epic June 6, 2003, first meeting between the mixed martial arts legends.’UFC Live’ is Round 5’s first scale figure, with an even higher degree of detail and realism than Ultimate Collector,’ said Damon Lau. Collectors and fans will notice a distinctly different look and feel to the line.Commemorating the memorable Couture-Liddell bout is a perfect way to launch UFC Live, added Barron Lau. Putting the two items together creates a classic scene from the fight which in many ways propelled both of their careers toward stardom.UFC Live will also feature a distinctive premium packaging that accentuates the figures and highlights the event for each pair in the series, in this case UFC 43. 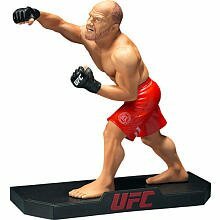 Round 5 is currently planning future UFC Live series figure pairs, to be announced.Round 5 has taken the next step forward in its offering of UFC collectibles with today’s introduction of “UFC Live” Series 1, featuring all-time UFC greats Randy Couture and Chuck Liddell from their historic UFC 43: Meltdown bout.